Works great in my high beams on my integra. The low beam was 9006, so i will be ordering that next. By the way HB3 is same as 9005 its just another name for it. HB3 is the same as 9005 - Factory Wattage ranges from 80W to 100W when they are halogen bulbs. HID Kit - 35W - Will use less power than the factory halogen but give 3X more light. These HB3 high density bulbs also provide your vehicle a safe environment to drive by increasing the visibility of the road. These headlights emit such powerful high intensity light that it is of major assistance during a very difficult road journey in the night time. In comparison to the ordinary OEM lights, there are two additional features that make HB3 more preferable. These consume very less energy. They also provide high intensity light similar to daylight during the night. These are high density xenon bulbs and can be replaced easily. As available in various other models, customization feature is also available in this type. These come in various colors and enable you to choose what is best suitable for your vehicle. 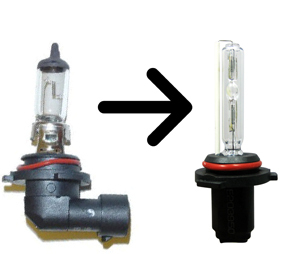 The look and feel of the car can also be enhanced by fitting one of the H#3 HID bulbs that are available in the market.